The Hunger Games: Mockingjay – Part 2 is now availalbe from retailers nationwide on Blu-ray Disc and DVD, and to rent from TV providers and online services such as Amazon Video and Apple TV. The Hunger Games: Mockingjay Part 2 (MSRP $39.99) on Blu-ray Disc is formatted in 1080p at 2.40:1 widescreen aspect ratio with audio tracks offered in Dolby TrueHD and Dolby Atmos. A DVD copy is packed into the combo edition, along with a Digital HD copy redeemable with UltraViolet. 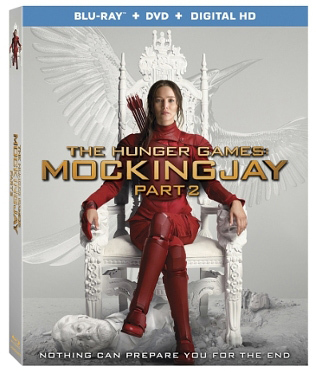 The Hunger Games: Mockingjay – Part 2 is also available in different exclusive editions from Best Buy and Target. And, a six-disc edition called The Hunger Games 4-Film Complete Collection (MSRP $64.99) was also released that includes all four films, 13 never-before-seen deleted scenes, and Digital HD copies.